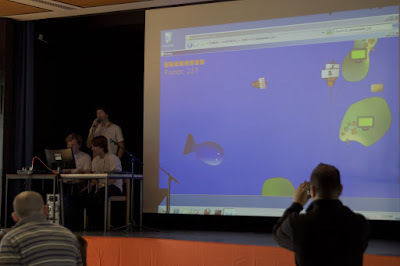 Some words about the prototype we developed at the Devmania 2011 on the theme Pirate. I don't provide links to download or play it because I don't feel I own it, read further. Edit: all the games are available on the Devmania's website! We were a team of four. Our game was just named Pirates (as many other ones). It was a vertical side-scrolling game where the player controls a ship and has to connect islands appearing randomly at the top of the screen in order to build a peer-to-peer network between them. Some enemy ships try to cut this cable, but fortunately you can shoot them with your cannons before that happens. The main drawback of the meeting was the lack of network connection. I couldn't have imagined a meeting of computer fans would provide no internet access. Well, now I can conceive it and therefore I will always put an Ethernet cable in my bag, and always attend to meetings with a switch. You should do the same as well! That implied we had to work with the only tools we had on our laptops. Because I developed Magnetic Glues on it, I still had the installation file of the Löve2D framework, so we decided to use this tool. Moreover, the documentation can only be found on internet, so the prototype provided a valuable starting point despite of its complexity, which has been dramatically reduced. Because we would not easily communicate our code (no version control), I thought it would be better to reduce the number of programmers and instead to produce some artworks. I am no artist, I can't produce great drawings, but the others have found them fun, so it's not a big waste of time. I mainly used Inkscape. Unfortunately I can't explain what they did on code because I took no interest to see it. I could just say that a common error has been repeated: at the end they rushed to provide instruction screen and to package the files. Anyway, I was not very productive on the project and I don't feel being really part of it, that's why I didn't uploaded it. Maybe a group member will do. I'm a software engineer and experience designer based in Karlsruhe, Germany. On this blog I share my projects and thoughts on computer science, game design, and media art.